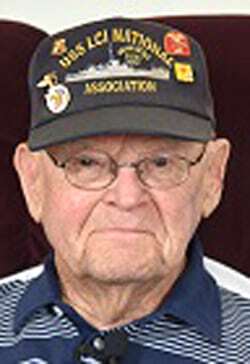 World War II Navy Veteran, Gunner’s Mate Second Class, Patrick J. O’Donnell Jr., 94, of Williamsport, passed away peacefully on August 31, 2018, at Valley View Nursing Home, Montoursville. Born in the Honeypot section of Nanticoke on April 19, 1924, he was the son of the late Patrick and Katherine Maday O’Donnell. He was a member of St. Boniface Church since moving to Williamsport, from Lewistown, in 1986. Pat loved nothing more than telling his stories about his abandoned landing craft infantry LCI 487 and LCI 93 during the first wave on Omaha Beach, Normandy, on D-Day. He served one year in the South Pacific on the destroyer USS Soley DD707 and was with occupation forces when Japan surrendered. Pat retired from the Acme Warehouse in Kearney, N.J., where he worked for 35 years. He was a member of the American Legion Post 350, Nanticoke, and the VFW Post 7863, Duboistown. In addition to his parents, he was preceded in death by his first wife, Francis Ann Nywoski, in 1993; sisters, Rita O’Donnell, Marie Novelli and Carole Zakrzewski; and brother, Joseph “Woodsie” O’Donnell. Pat often said he’s proud to have been loved by so many people, especially by those in two different families. Surviving loved ones are his wife of 19 years, Delores M. Mattern, Williamsport; daughter, Catherine A. Fry, Hillard, Fla.; granddaughter, Charlene M. Williams, Glendale, Ariz.; grandson, Tom Donohue Jr., Washington, D.C.; three great-grandchildren, Elizabeth, Daniel (serving in the U.S. Army and stationed in Alaska) and Matthew; sisters, Loretta Urban, Denville, N.J., Alice Russamano, Newark, N.J., Patricia Cherpak, Wilkes-Barre; stepchildren, Bruce, Brett, Debra; stepgrandchildren, Sean, Lucas, Jessa and Shelby. Funeral services will be held on Friday, Sept. 7, 2018, at 11:30 a.m. from Kearney Funeral Home Inc., 173 E. Green St., Nanticoke, with a Mass of Christian Burial at noon in St. Faustina Parish. He will join his first love for entombment at St. Mary’s Cemetery, Hanover Township. Family and friends may call on Thursday, Sept. 6, 2018, from 6 to 8 p.m. at the funeral home. In lieu of flowers, donations can be made to The American Cancer Society in memory of his first wife, Francis, and in tribute to his second wife, Delores’s successful battle with cancer. To leave an online condolence for Pat’s family, please visit www.kearneyfuneralhomeinc.com.